Chemistry never sounded this good! By now, the word is out at UCLA that undergraduates in Neil Garg's organic chemistry course produce clever, creative music videos as an extra-credit assignment. The bigger secret may be just how much chemistry they learn by doing so, as none of them are chemistry majors and most admit they didn't like chemistry when the class started. It's a little too soon to say which music video will be this year's sensation. A strong candidate is "We're Yours" by the Gargonauts — Rachel Stafford-Lewis, Myan Pham, Ali Lanewala and Jordan Halfman — which achieves the desired trifecta of excellent chemistry in a video that sounds and looks great. But unlike last year, when one video, "Chemistry Jock" — which has become the gold standard of the genre, with 38,000 YouTube views and many fans — ran away from the competition, this year's field is much deeper. This quarter, 250 students produced 87 videos. Among the most notable are "Let It Be" by John Boles and Edgar Gonzalez; "Forget That" by Alex Jaksha, Sean Nguyen, Kevin Nishida and Nakia Sarad; and "O-Chem Toolbox," sung with stellar vocals by Michelle Azurin, joined by Daniel Brenners, Frank Choe and Mike Dai. Yannick Goeb and Kimberly Bui, who starred with Justin Banaga in "Chemistry Jock," are fans of "O-Chem Toolbox." "When I am doing the problem sets or taking a test, I find myself singing the various chemistry songs that people wrote and it helps me remember all the details," said Rachel, a sophomore majoring in microbiology, immunology and molecular genetics. Rewriting lyrics helped her to learn the chemistry, she added. "I catch myself randomly singing the lyrics while I'm walking through the halls and just kind of laugh," said Edgar, a sophomore physiological science major. "It's crazy, because up until this point, I had hated chem. I remember when I first signed up for the class I was afraid, but I soon realized I had a great professor. I can honestly say that Professor Neil Garg has not only made it a fun class, but he made me care about learning chemistry. You can tell how much he cares about his students by the time and effort he puts into his lectures. He always had a dozen or so pieces of computer paper on which he wrote his lecture notes. "Making the music video was really fun, and a great way to get out of my comfort zone and at the same time learn some chemistry. I would recommend this course as long as Professor Neil Garg is teaching it." Myan, a second-year pre-med history major, agreed, saying, "Making this video motivated me to do better in the class. This is my favorite chemistry course by far. It's a lot of thinking and solving problems; I've learned a lot. Sometimes we forget that learning should be a fun experience." Myan added that she's "never been superbly great in chemistry" and "it's always been a little hard" for her, although you'd never suspect that watching her sing "We're Yours." You've got two molecules, with carbonyls, wow! John, a life sciences major, like many of Garg's students, said, "I looked forward to class with Professor Garg. He turned a class of potential hours of memorization and confusion into a series of intricate logic games with organic molecules. I had a great time with my buddy Edgar making the movie. As I studied for the final, at least twice in my head I've sung a part of our song or a part of another song from last year. Putting the exceptions and rules of thumb to music helps me remember concepts like solvation and which solvent causes which reaction." Jordan, a second-year psychobiology major, called the course "an awesome experience" and said, "I've never had a professor so qualified in all aspects to teach a class." He added, "After spending so much time learning so many different reactions, a chance to use that knowledge creatively was a very welcome break." The students uniformly agreed that making the videos was great fun. "We had a great time shooting our video," Rachel said, adding that she and her creative partners knew early on that "we were going for a different feel" from the rap music videos that dominated Garg's class last year. "Organic chemistry is as difficult as you make it," she said, noting that Garg "does help to make it more interesting and entertaining than I ever thought possible." "I loved taking Chem 14D with Professor Garg," said Michelle, a neuroscience major who just finished her third year. "It's not one of my best subjects, but he definitely taught us that chemistry doesn't have to be intimidating. We were encouraged to be innovative with the information we learned, and I think that is the thing that I appreciated most about this class. "My friends and I had a great time making the video. We were looking for ways to create both an entertaining and educational video, and we are happy that we could share that, and most importantly, that other people enjoyed watching it as much as we enjoyed producing it. I learned that there are definitely outlets for creativity in all subjects, including chemistry." 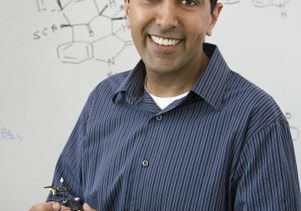 Most of the students who take this course "come in with little or no interest in organic chemistry," Garg admitted. They don't end the course that way, though. Last year, only 5 percent started the course with a high interest in organic chemistry, but by the end of the 10 weeks, most of the students said they had a high interest. Why does Garg offer students this optional extra-credit assignment? "The majority of the Chem 14D students are hooked on technology, such as the Internet and YouTube," Garg said. "Rather than fighting this, I designed the assignment to take advantage of the students' strengths and interests. I didn't realize at the outset that so many students would create spectacular videos. When you consider the clever lyrics about organic chemistry and the high quality of the video editing and the audio, the TA's and I were extremely impressed by how amazingly creative UCLA's south campus students are. "Don't believe anyone who says creativity is mostly in the humanities and arts; the evidence otherwise is right in these videos. And for all the time the students put into creating these videos, we give them some extra credit, but not much." If your musical taste runs more to Lady Gaga, you might enjoy "Bond This Way," starring Natalie Green, Storm Hagen, Megan Johnson and Kylie Wilson and directed by Brian Tan. Garg's course website has all these music videos, and more. Garg called this year's class "Chem 14D Jedi," and many of the videos picked up this "Star Wars" theme, in which the students strive to become "Chemistry Jedis."